Another day another bundle, except this Indie Royale is certainly doing something a little different. It seems as if the Indie Royale folks have finally settled on a plan from here on out: one main bundle a month with smaller lightning deals mixed in on occasion. It's a plan I can certainly get behind, especially based on the quality of the first lightning deal. To kick things off, the folks at Indie Royale, alongside Croteam and Devolver Digital are offering an all Serious Sam pack for the next few days. 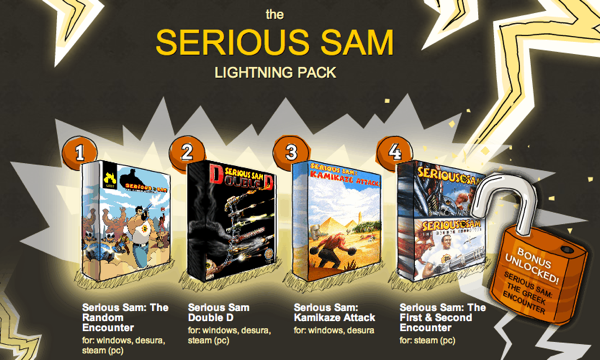 Serious Sam is kind of a polarizing figure. Is he awesome, or just a Duke Nukem rip-off? Are the enemies creative or just insane products of a bad acid trip? Is the shooting mindless and fun or repetitive and dull? Is the story ridiculous and insane, or completely ridiculous and insane? The answers to this vary from person to person but if you're a fan of the old school style of shooters like Doom, Duke Nukem and Painkiller then you should definitely give Sam a chance. Plus, you'll never get a better opportunity than this great deal of a pack. This is the first adventure of "Serious" Sam Stone, and basically sets the tone for the rest of the series. You begin by time travelling to Egypt in order to change the past and prevent the invasion of an alien horde led by the evil Mental. Despite all odds, you find a ton of guns scattered about Ancient Egypt, as well as many enemies to fire these guns at. 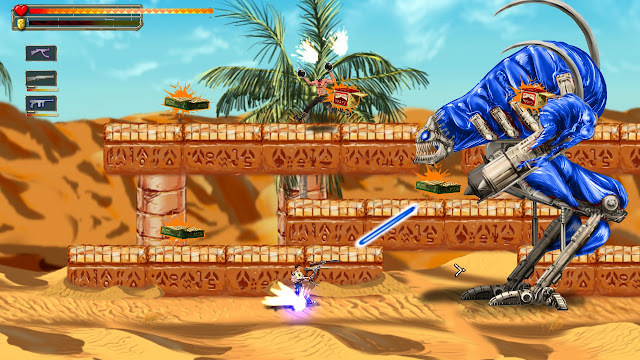 The gameplay is the very definition of run and gun action, with dozens of enemies teleporting in and charging at you. The weapons are generally pretty standard selection of guns, with variations on shotguns, pistols, rocket launchers and more making up the arsenal. Less standard are the selection of enemies: there are vicious one eyed teethy monsters, charging horse-like skeletons that breathe bolas, giant scorpion centaurs with chainguns for claws, screaming shirtless headless bombers and more. The nonsensical enemy design is basically a series staple at this point, and it constantly manages to repeatedly top itself; just when you think the enemies can't get any weirder, they do. Otherwise known as Serious Sam 1 Part 2. I don't mean to sound lazy, but it's pretty much identical to the first game. There are new locations like Aztec jungles and ancient castles, more weapons, crazier enemies—jack o' lantern with a chainsaw anyone?—but the gameplay is almost completely identical. So go back three paragraphs and read that part again. But since I have to use this space for something I might as well let you know that the versions included with the Indie Royale are the original releases, not the HD versions. Though it may seem weird considering how retrocentric my site is, and I probably sound superficial, but I much prefer the HD versions. The Serious Engine 3 has some excellent improvements in terms of animations and models, plus I find the physics are a little smoother. Also, the HD versions are a little nicer in terms of modern computers—they support widescreen, for example. That being said, you'll get functionally the same fun experience regardless and buying through the Indie Royale gets you three extra games to boot. It just looks a little more old school and vintage. Plus the HD versions go on sale all the time on Steam, so you can probably pick them up for $1.25 down the road. What you won't get from the pack on Steam are the indie titles. 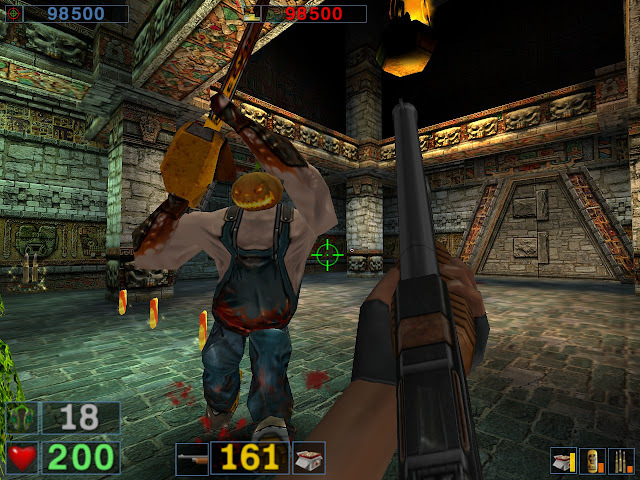 The Serious Sam Indie series was a promotional device planned up by Devolver Digital to promote the release of Serious Sam 3: BFE. 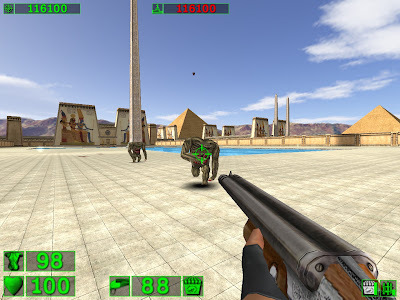 The idea was that since Serious Sam is technically one of the older indie series out there, they would commission various indie developers to create their own re-imaginings of the Serious Sam formula. The first release was Double D, developed by Mommy's Best Games as a 2D side scrolling shooter take on the Serious Sam games. The main hook (oh ho!) is the various connectors found around the world. Sam can use these hooks to attach guns together, creating ludicrous stacks of weaponry. A rocket launcher with two shotguns attached to it? Four tommy guns strapped to a grenade launcher? Chainsaw on chainsaw on chainsaw on chainsaw? You can do all of this and more through the very intuitive stacking inventory system. These guns come in handy when you encounter the usual insane assortment of enemies, plus a few new ones. The developers almost parody the wacky enemies with their additions to Mental's hordes, with half monkey half jetpack beasts and menacing fusions of vuvuzelas and stacks of pancakes. 2D perspective and gun stacking aside, the game still feels like a Serious Sam title with all of the usual tropes in play. You still have secrets, hordes of monsters, giant bosses and vague puzzle moments. To sweeten the deal, there are several bonus challenge modes and a host of achievements to unlock. In the end, Double D feels like a full featured release, and worth the bundle price alone in my humble opinion. Just a bit of a warning: the expectations I had for this game were impossibly sky high. Vlambeer is the developer of Super Crate Box, otherwise known as my favourite game of all time ever. So I was just a tiny bit disappointed this game didn't capture my whimsy the way Super Crate Box does. That being said, it's still a decent title. 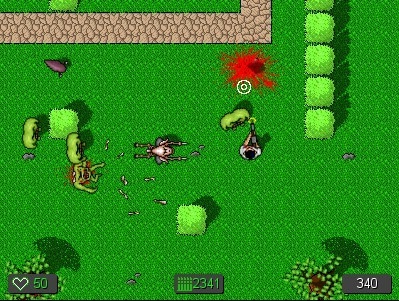 Random Encounter takes Serious Sam and moves it to the least likely genre: turn based RPG. Fortunately, the whole running backwards and shooting experience is totally intact. Each battle consists of Sam and his party furiously backpedalling as a huge horde of traditional Serious Sam enemies charge at you. You select your gun, aim your attack and then end your turn; for the next five seconds you can move Sam's party vertically as your attack plays out, dodging enemies all the while. It's a fairly ingenious combat system and it works very well, particularly for bosses. My other favourite element is the graphics; they look really excellent, bright and crisp, particularly the highly detailed boss sprites. The rest of the game isn't stellar, but it is functional. The overworld contains some parodyesque "puzzles" but also features one of the worst elements of the genre: random encounters. I understand that's the whole title of the game, but in this day and age I'm far less tolerant of them. I'd much rather have had groups of enemies visible on the world map like the majority of JRPGS do these days. But I suppose my only real complaint towards the game is that it doesn't feel like a full featured release. 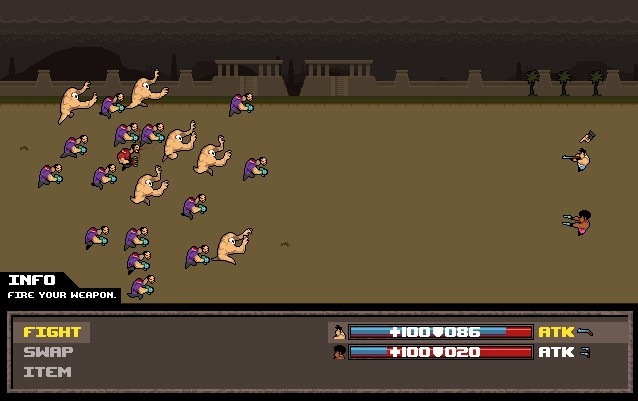 When you compare the amount of extras and polish in Double D, Random Encounter winds up feeling more like a proof of concept for the battle system. I mean, the battle system is great, but the game surrounding it doesn't have the same amount of polish. But hey, it's cute to see in action. 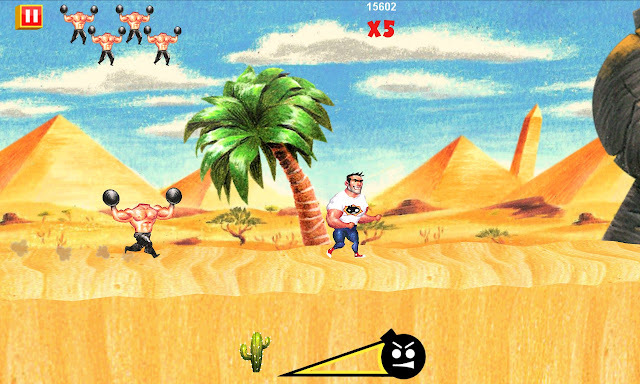 The only iPhone game in the Serious Sam indie series, now on PC. Let's get the obvious comment out of the way: yes, it's an iOS title so yes, it is fairly simple and casual. It's still quite fun. 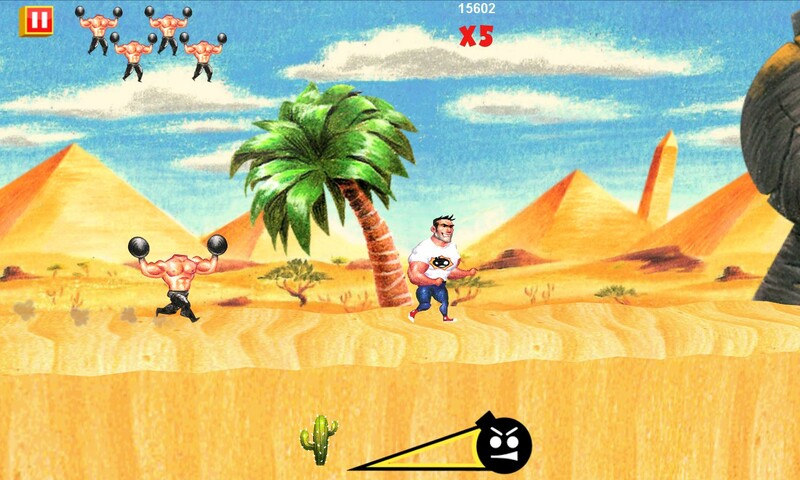 You take on the role of one of those "headless freaks" and run towards Sam, who's running through Egypt blissfully unaware of his impending doom. It's a Canabalt style clone, except one with an end goal and the ability to attack, kicking forward to deflect and destroy obstacles. Attack too often however, and your headless avatar gets overexcited and explodes. The real addicting elements come from the bonus objectives found in each level (usually revolving around destroying so many obstacles) and also the slow trickle of upgrades you get following each victory. Another excellent touch is the graphics, which look beautifully shaded with colour pencils. It's too simple to call it a full game, but there's a lot of content and fun to be had in this little diversion. The Greek Encounter is billed as a bonus, and rightly so. It's a commissioned piece from Eric Ruth, the guy behind many brilliant NES demakes of current games like Left 4 Dead, Halo and the tragically ceased and desisted DJ Hero. While I'm sure the Serious Sam series is rife with possibilities for demakes, this release feels... well, not lazy but possibly rushed. The brilliance of the other Ruth games are that they were built according to the specifications of the NES, but Greek Encounter cheats a lot; it's little things, like the way that Sam's sprite can fully rotate and the fact that twin stick shooters are not a very retro genre. The enemies are all taken from the Sam canon, but there's not a lot of differences between them besides how many bullets they can take, while the levels themselves are very repetitive and hard to navigate. It's mindless fun for a few rounds, making it a fine bonus, but don't expect amazing things. So here we are at the end, and not one "seriously good deal" joke. I'm proud of myself. If you're new to the Serious Sam games and these sound great to you, there's never been a better chance to jump in. If you're an old fan there's plenty of fun to be had with the indie titles, which are absolutely full of glorious fanservice. It's a great pack if you're into old school over the top shooters, so why not check out the Indie Royale page to pick up your own bundle. For the latest on backlogs, reviews and bundles you can follow me via Twitter to keep up to date. Glad to hear I didn't miss out on much. The main games don't really interest me at this point, and I unknowingly bought Double D with the GetGamesGo thing.